Cannon Beach Vacation Rentals. Thank you for being reliable, dependable, and very courteous. Look forward to coming back again. Had a great time and couldn't ask for more help from all staff before and after stay...also very prompt with every request. Like Arnold said, "We'll be back!" Property was exactly as expected. The place had everything we needed plus extras such as pool toys and board games. We thoroughly enjoyed our stay. We have used your company twice now and would have no hesitation using you again. Thanks. The property was great and we were treated very well by the staff. Thank you for a great time. Always pleased with your company's services! Looking forward to further rentals. We had a fabulous experience with your company. Your staff is friendly and responsive. The house was beautiful and very clean. We loved Hidden Treasure and would definitely come back for another visit! We had a wonderful stay in our rental property! It was clean, nicely decorated and had everything my famIly needed to stay for a week. It had all the charm one would expect a beach cabin to have! We will definitely come back again and stay in the same place. 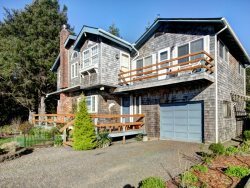 Cannon beach vacation rentals were easy to work with!